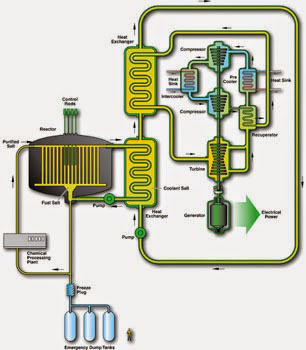 “The Molten Salt Reactor (MSR) system produces fission power in a circulating molten salt fuel mixture with an epithermal-spectrum reactor and a full actinide recycle fuel cycle. In the MSR system, the fuel is a circulating liquid mixture of sodium, zirconium, and uranium fluorides. The molten salt fuel flows through graphite core channels, producing an epithermal spectrum. The heat generated in the molten salt is transferred to a secondary coolant system through an intermediate heat exchanger, and then through a tertiary heat exchanger to the power conversion system. The reference plant has a power level of 1,000 MWe. The system has a coolant outlet temperature of 700 degrees Celsius, possibly ranging up to 800 degrees Celsius, affording improved thermal efficiency. The closed fuel cycle can be tailored for the efficient burnup of plutonium and minor actinides.” – See link ……….